Max is an unusual 8 year old boy. He likes to be by himself. He has poor social skills. He needs a schedule, and commitment to it. He doesn't like change. And sometimes he gets “stuck.” But he does have an imaginary friend, Budo. This delightful story is all about Max's imaginary friend. And the fun part is, it is written by Budo himself! Budo is invisible to everyone but Max and he can go wherever he wants, which makes him a great storyteller! We learn what it is like to be imaginary. Budo can be seen by other imaginary friends, like Graham and Puppy and Teeny and Oswald. But all imaginary friends are just what their makers imagine. Budo can walk through closed doors, because that’s how Max imagined him. But he can’t sleep, because Max didn’t think of that. Some imaginary friends can fly. Some, like Puppy, are not very smart. Budo, of course, is very smart! Imaginary friends live until their makers forget about them. Many of them “disappear” the first few days of kindergarten, as their makers begin to interact with, well, real kids. But some live on much longer. 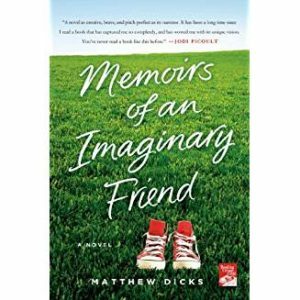 Did you have an imaginary friend when you were a child? Someone you could talk with, play with, or seek wisdom from? Please tell us about him/her! I didn't. However, I do have an imaginary friend now. His name is Beryl. This sounds wonderful. Is it something young adults would like or should read? Oh yes! I think it was written as an adult book, but it would be wonderful for young adults! I have never had an imaginary friend. Your review and our conversation is motivating me to use my imagination to create one! Imagination is a pretty cool thing!! !